What would you say if I told you there was a secret conspiracy all around you? What would you think if I was to reveal that supernatural creatures – the kind you only hear about in books or movies – are plotting in the shadows? How would you feel if I showed you these creatures influence humanity and direct affairs away from our prying eyes? There is a secret story being told, I would say to you. A story that you can be a part of… if you dare. The reason I know is I’m part of the story. I’m part of this vast conspiracy. You see, every Sunday, myself and few of my friends get together and LARP (Live Action Role Play). This essentially means for a few hours we dress-up like a vampires, werewolves, and wizards and pretend to take over the world. Playing an evil wizard at a New Orleans LARP convention. Live Action Role Play is a strange hybrid of improvisational theatre and Dungeons & Dragons. Building off the tradition of murder mystery theatre, LARP came into vogue in the early 90s when game designers decided there might be something compelling to making traditional table-top games interactive. This meant players could dress up like their characters and interact with other players in dramatic scenes just like in stage play. I’ve been playing LARP for almost as long as I’ve been writing plays. In a way, I found my writing voice thanks to the storytelling I was a part of in my local role-playing troupe. When I started, I was playing in nightclubs along Queen West in Toronto. But as the hobby grew, and more players got involved, the venues also got bigger. Before long I was playing off of hundreds participants in hotel convention halls all over Canada and the States. LARP is a unique hobby attracting a wide swath of people who play all sorts of character types. Some play kings and queens. Others are spies and sorcerers. Still others are heavy hitting thugs or deadly assassins. But all of them contribute to the mass creation of a collective story about a hidden society of supernatural power brokers vying for control of the night. Oh, the drama and the stakes! 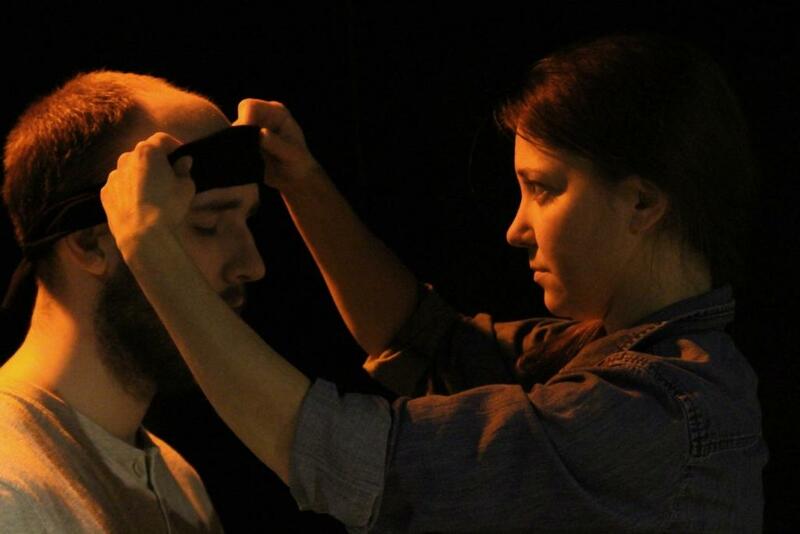 Myself and Sara Weber from Test (2013) in the Hamilton Fringe. I’ve written two plays about LARP. Shadow Court (produced in 2005) is the story of gamer group coming together to grieve for a friend. It was a very personal show drawn from my own experiences as a gamer. Test is no different. It’s a story about two people who get caught up in the game – both in and out of character – and how they try and negotiate their budding relationship. Test was last seen in 2013 as part of the Hamilton Fringe Festival with myself and Sara Weber in the feature roles. Ever since that time, my director and colleague Aaron Joel Craig has been adamant about bringing it back to Hamilton. This month we’re finally getting the chance. And we’re fortunate to now have Rose Hopkins and Adam Lemieux onboard to perform in this new version of the play at the Staircase Theatre. LARP is weird, no question. But in the words of Dana from the play: “weird is good.” And I’m looking forward to sharing the secrets of this weird hobby during the run! Last year, at the Hamilton Fringe Festival, Same Boat Theatre premiered a workshop production of my newest play Your Own Sons. Now, every playwright always has nerves about the opening of a new show. But this one had me particularly on edge. It all had to do with the topic. Homegrown radicalization and the war with ISIS in the Middle East does not make for a light evening of theatre. Would such a play find an audience at the Fringe? I, honestly, didn’t know. Your Own Sons was met with receptive audiences and critical reviews including Reviewer’s Pick by View magazine. What’s more, we were selected as one of the shows included in the inaugural Encore Festival produced by Darren Stewart-Jones (producer of the popular HamilTEN Festival) along with three other productions. I was proud of the work that was put into the Fringe production but, always on my mind, was the fact that it was a workshop. We were trying out a new script and still developing the characters and the story in preparation for a longer production to be staged in 2018. Creating theatre is a long and complicated process as a script takes time to manifest and evolve. The workshop draft of Your Own Sons that was produced at the Fringe was remarkably different than the first draft I hammered out months before. In the same fashion, the version of the play we’re presenting this month is quite different than the one we presented at the Fringe. And it’s a real privilege to finally have such an opportunity. 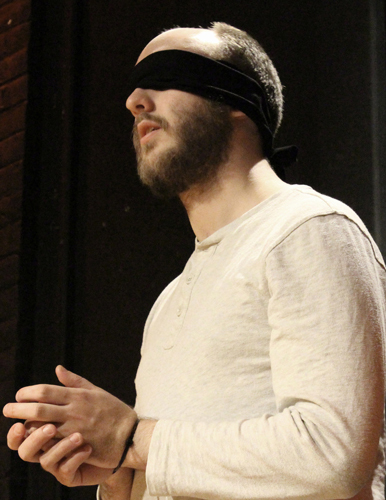 Oftentimes, new play development that happens on the festival circuit doesn’t translate into subsequent runs so audiences are unable to see the evolution of the work. That’s not the case here. Now some might ask how the show has changed from one incarnation to the next. We have some new cast members who have joined the team along with some new design elements that were unavailable to us at Fringe. As well, the longer run time has allowed us to fill in the story of how radicalization has touched the lives of several of the characters. The central character of Pauline is given more room to explore the plight of her missing son. And we’re also given more time with the character of Dan. A father suffering like Pauline, Dan’s story was only hinted at in the workshop through a series of monologues. This production sees his story much more fleshed out. And thanks to a City Enrichment Grant from the City of Hamilton, Same Boat Theatre has the opportunity to produce this show at the Pearl Company Arts Centre. So many companies have been hosted at this community-driven arts venue and we’re pleased to now be a part of it and to share the next incarnation of Your Own Sons with audiences now as we did ten month ago. We hope to see you there and to hear your thoughts on this new(ish) work. Your Own Sons runs from April 19-28 at the Pearl Company. Purchase tickets HERE. An odd thing happened at It’s Your Festival last weekend. I bumped into my Ward 3 Councillor Matt Green. I told him I had a new play in this year’s Fringe Festival. His response? “Is it political?” And all at once I realized my reputation as a Canadian playwright in Hamilton. I didn’t set out to write politically-charged theatre. When I first came to Hamilton, the first play I produced was the science fiction story Interface. That was followed by the geek love story Test. But everything after that has been political in some form or fashion. From paranoid rants (Conspiracy of Michael) to Canadian spies (An Ordinary Asset) to Conservative scandals (Finding Mr. Right), most of my work since 2014 has been issue oriented. Your Own Sons isn’t all that different except that it feels far more immediate than anything I’ve ever tackled. The story of the play is directly inspired by the story of Christianne Boudreau. Ms. Boudreau’s son, Damian Clairmont, left Canada in 2012 after being self-radicalized in Canada. He told his mother he was going to Egypt to study Arabic but he actually went to Syria to fight alongside ISIS forces. He was killed by the Syrian military in 2014. Ms. Boudreau’s story deeply affected me. As a parent, the very idea of losing a child is horrendous. But to the lose them to violent extremism is this manner is incomprehensible. With every story I saw of families losing their sons to both self-radicalization and war I found myself more and more troubled by an issue with seemingly no rational explanation. What’s more troubling is that Ms. Boudreau is not alone in her experience. 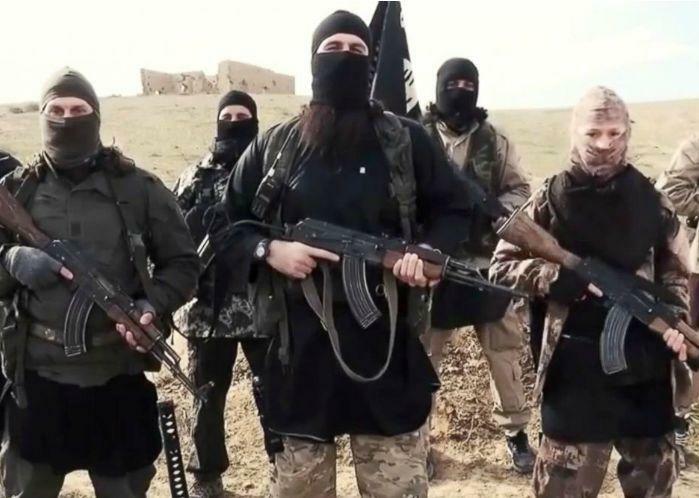 It’s estimated that well over 27,000 foreign fighters like Damian have traveled to Iraq and Syria since fighting broke out in 2011. But the catalyst to write this story, and to find my own voice in it, happened on Oct. 22, 2014. On that day, a young man named Michael Zehaf-Bibeau killed Hamilton-born Canadian Army reservist Cpl. Nathan Cirillo at the National War Memorial in Ottawa. Afterwards, Zehaf-Bibeau stormed the Parliament Buildings before being shot and killed by security and police. Like Damian Clairmont, Zehaf-Bibeau had been self-radicalized towards radical Islamic ideology. He had tried to leave the country but had his passport revoked by authorities. Like many Canadians, I found myself feeling a whole range of emotions as the events in Ottawa unfolded before my eyes. As the tragedy swirled around my old hometown, and later as they impacted my new home when Hamilton paid tribute and bid farewell to Cpl. Cirillo, it was impossible not to draw an invisible line of trauma between the two cities. Writing Your Own Sons has been my attempt to see why I drew an invisible line that day and why it still pulls on me. Ms. Boudreau’s experience is not my experience. And neither is that of the parents of both Nathan Cirillo and Michael Zehaf-Bibeau. But as a father of two young children, I can imagine what it must be to lose your child. I think it’s something every parent must secretly fear deep in their heart. But with the birth of my son, admittedly, I also began to imagine what it must be to lose your child to the type violent extremism that seems to be affecting so many young men. As my correspondence with Ms. Boudreau has revealed, it’s a terrible place to be. Especially when no one seems to be listening. And I think that’s why I’m compelled to write issue-oriented theatre. With Your Own Sons, I’ve tried to come to grips with a topic that some treat as taboo and others reduce to ideological talking points. As a character from the play admits, it’s “trying to bring some light in”. For me, this is at the core of political theatre: how dialogue on the stage can inspire dialogue in the audience. I hope that will happen with Your Own Sons. Because as hard as this issue is I think it is one that needs to be talked about by everybody. A portion of the proceeds from the Festival performance of Your Own Sons will go to Hayat Canada to assist parents and families coming to terms with violence and radicalization involving their children. For more information on Hayat Canada, or to donate, please follow the LINK. A few days ago, I was all set to post a blog about the process of rehearsing for our upcoming production of Two Rooms. Specifically, I wrote about the research that went into portraying the journalist character of Walker who is equal parts ally and antagonist to the main character of Lainie in the play. 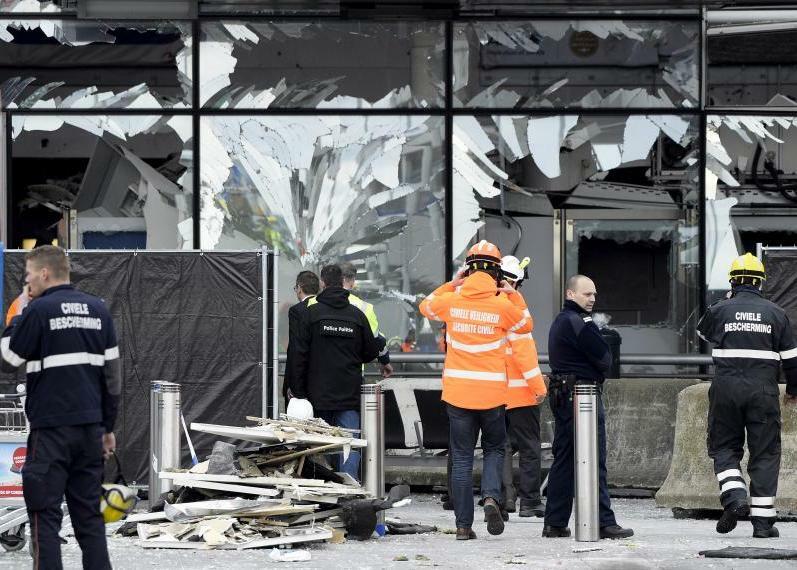 But then, earlier this week, a terror attack occurred in Brussels killing dozens and sending more shockwaves of fear throughout the Western world. And, given the subject matter, I felt like there was something more to be said about the process of doing this play amidst the the shadow of the real. Two Rooms is a play about the invisible, yet unbreakable, bond between two lovers torn apart by terror. Written in 1988, and winner of Time Magazine’s Best Play of the Year, the script was a direct response to the (then) looming Iran hostage crisis. 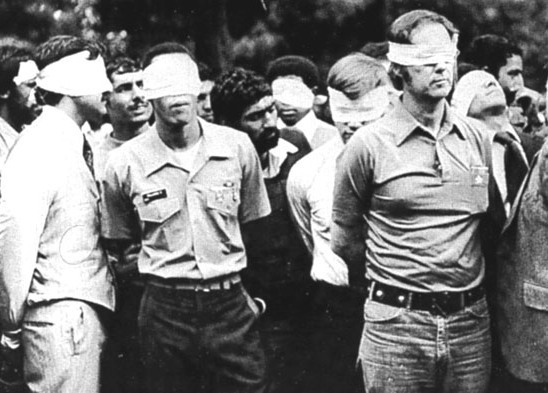 During that crisis, more than sixty American diplomats and citizens were held hostage for over 400 days between 1979 and 1981. It redefined US foreign policy in the Middle East with consequences that continue to the present day. Lauren, our director, has always said that the relationships in the play should take centre stage. That said, there is no denying the spectre of real world terrorism that hangs over the play. And, in the case of our company, it has been there since the beginning. We first decided to produce Blessing’s drama last October. At that point, there were a lot of discussions between Lauren, Aaron, and myself about the impact of doing a play about terror hostages in the age of ISIS. Having witnessed a multitude of images ranging from ISIS training clips to the infamous YouTube execution videos, we questioned whether to set the play in a more contemporary setting. Indeed, it was a topic of hot debate. Then, in late November, on the very night we confirmed our production venue came the news of the horrific attacks in Paris and Beirut which left scores of people dead. The process of rehearsing this play has been a very different experience for all of us at Same Boat Theatre. It’s not the first time we’ve taken on a subject based on current events. But it is the first time we’ve ever taken on a subject with such immediate and dramatic weight. Going into rehearsal, each of us has had a sense that this play is still so very timely. Sadly, all you need do is turn on the television. The images of blindfolded prisoners of ISIS look very similar to the blindfolded prisoners in Beirut thirty years ago. This proximity to the real has made us all work more diligently and more honestly during the whole process. Beyond the sense that this play has been ‘ripped from the headlines’ is the fact that people like Michael and Lainie exist in this world. 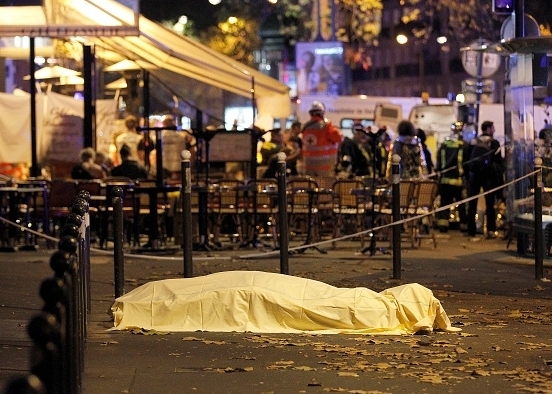 Ordinary people have and sadly will continue to be victims of terror. But this play has forced us all to look at the complex issues surrounding terrorism a lot more closely with an eye towards understanding. And if our production of Two Rooms serves to do the same with even one member of our audiences then we will have done right by the playwright and his powerful script. This is the second time I’ve directed Lee Blessing’s Two Rooms. 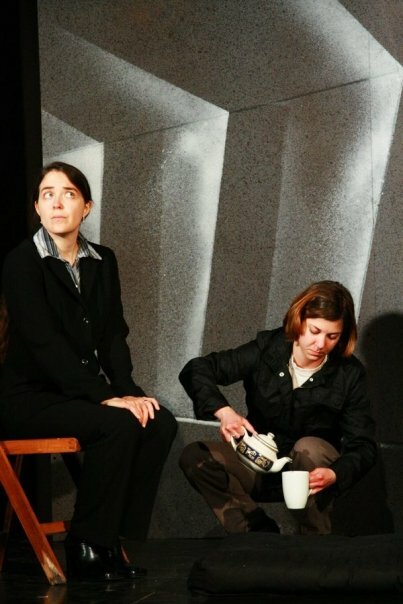 The first time was in 2008 with Black Box Fire as part of the company’s Emerging Artists Series. I never thought I would direct the piece again. But I’ve always loved the script and thought it would be a great fit for Same Boat Theatre. It deals with a political situation but in a way that addresses the human side of the situation, as well. Lee Blessing wrote Two Rooms in 1988 and Blessing himself said he hoped the play wouldn’t be as relevant in 20 years, but unfortunately it is… very much so. Two Rooms is the story of Michael, an American educator, who is taken hostage in Beirut. Lainie, his wife, is at home in the US. She has cleared out his study to resemble the room in which he is being held. This room creates a door for Lainie and Michael as well as for the audience to engage with the story on a human and emotional level. And that is what continues to draw me back to this story. When I first directed this show eight years ago, I didn’t have the life experience to see it as I do now. And in another eight years, I’m sure I could look back and say the same thing. I have noticed through the process so far, that I have a different, and better, understanding of what Lainie and Michael must feel being torn apart. I’m currently engaged and that has allowed me to approach this process with more empathy. I can more clearly see how devastating this story is, and why someone would cling to what little they have of their lost partner. I suppose Two Rooms is a story I still want to tell, and a story I want to hear. Perhaps directing the show a second time is a little like listening to a cover of a song you love, though in this case I don’t think there’s an original version and I’m not concerned about comparing the two.